Greetings Guinea Pigs – for the third year, we're going to be doing a dinner event in conjunction with the South Beach Wine & Food Festival. 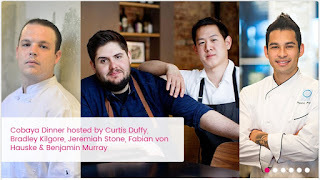 We're incredibly excited about this year's lineup, which includes chefs Curtis Duffy of Chicago's Michelin 3-star Grace, Fabian Von Hauske and Jeremiah Stone of New York's Contra and Wildair, Miami's outstanding talent Bradley Kilgore of Alter, and Benjamin Murray, chef at host restaurant Azul, where we had Experiment #21. And you have the chance to get tickets before the mad rush, at a discount for Cobaya members - at $225 (regular price $250) (and that price is inclusive of wine pairings). But you'll need to book by October 19 (next Wednesday). (If you have any difficulties downloading the form, email us at reserve@cobaya.miami and we'll get it to you). Better move fast! Hope to see you there.